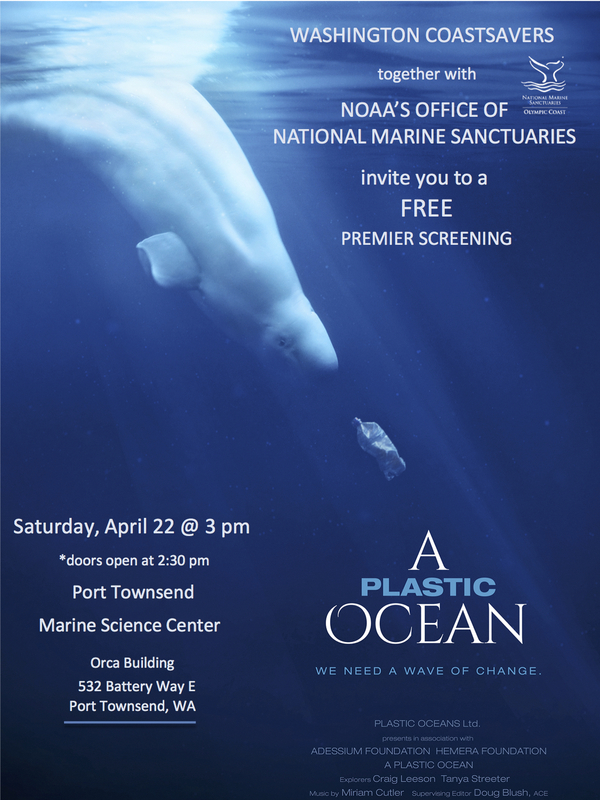 PTMSC Blog : Screening of "Plastic Ocean"
A PLASTIC OCEAN uncovers the shocking truth about what is truly lurking beneath the ocean’s surface. More than 8 million tons of plastic is dumped into our oceans each year. A PLASTIC OCEAN follows an international team of adventurers, researches and ocean ambassadors on a mission around the globe. This award-winning documentary shows the devastating effects of our disposable lifestyle on marine life and the consequences for human health. During its four-year production period, A PLASTIC OCEAN was filmed in 20 locations around the world, documenting the global effects of plastic pollution and introducing workable technology and policy solutions that can, if implemented in time, change things for the better. NOAA Office of National Marine Sanctuaries together with Washington CoastSavers are hosting free screenings in Port Angeles at Peninsula College on April 13th at 7:00PM, and in Port Townsend at Port Townsend Marine Science Center on April 22nd at 3:00PM. The screenings will be followed by panelist discussions and are open to the public. Washington CoastSavers is an alliance of partners and volunteers dedicated to keeping the state’s beaches clean of marine debris through coordinated beach cleanups, education and prevention. Make a difference, register for April 29, 2017. A PLASTIC OCEAN can be found on iTunes and other online movie platforms. The Port Townsend Marine Science Center inspires conservation of the Salish Sea. A new initiative—Gone Green? Go Blue! Support Your Local Ocean—encourages collective action and civic engagement. Located on the beach at Fort Worden, the PTMSC offers two public exhibits: the Marine Exhibit and the Natural History Exhibit. The Natural History & Orca exhibit is open Friday through Sunday, 12 to 5 pm. Admission is $5 for adults, $3 for youth, and free to PTMSC members. The PTMSC also offers a wide variety of educational programs and special events. For more information, call 360.385.5582, e-mail info@ptmsc.org or visit www.ptmsc.org/events.